Professor Ritchel was a talented inventor with many patients to his credit. 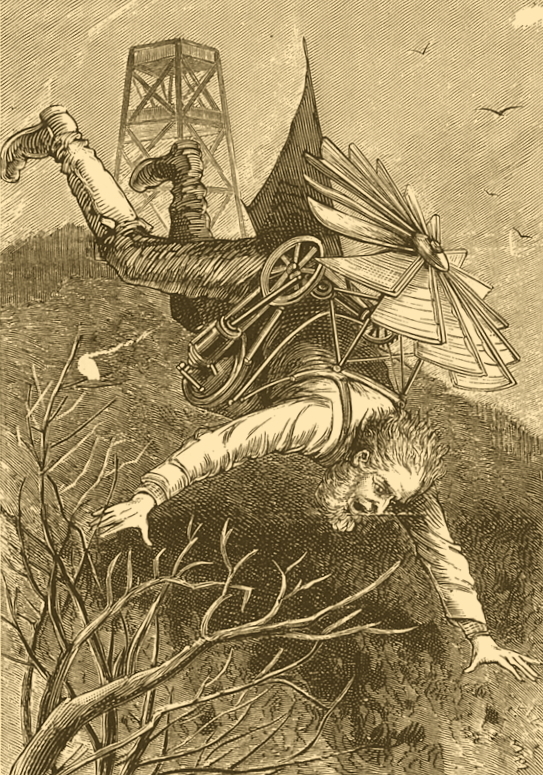 Around 1870 he became interested in developing a flying machine that could travel the sky in any direction despite wind currents. In Ritchel’s day, the only way to “fly” was in a balloon, but balloons were at the mercy of prevailing winds, updrafts, and down drafts, and in places like New England the possibility of being blown out to sea was certainly a concern. In November of 1876 Ritchel moved from Corry, Pennsylvania, to Bridgeport, Connecticut, to begin development of his flying machine. By March of 1878 his first airship was nearing completion. (It is said he eventually built five.) The final work was being done in the large hallway of the Riverside Hotel in East Bridgeport, and the project had reportedly caught the attention of famous circus owner and showman, P.T. Barnum. Ritchel’s flying machine was of a dirigible type, with propellers that controlled upward and downward motion, and allowed for steering in the air. The machine had no motors, and motion of the propellers was achieved by the pilot operating a series of cranks and levers utilizing his own muscle power. The gas cylinder or envelope was described as being made of black silk, 24 feet long, and 12 feet in diameter, holding 3,000 square feet of gas. By the spring of 1878 he’d completed construction, and on May 8th, gave a successful indoor exhibition of his new invention in one of the Centennial Exposition buildings in Philadelphia. After Philadelphia, Ritchel exhibited his flying machine at a hall in Bridgeport, Connecticut. Among those invited to attend were members of the Franklin Institute, and others of the scientific community. The following newspaper account relating to the Bridgeport exhibition is from The Charlotte Democrat, dated June 14, 1878. It’s likely that the Bridgeport exhibition described above occurred early in the month of June, or even late May, given the publication date of June 14, 1878 in a southern newspaper. A large crowd had watched as the air ship ascended from a ball field near the Colt Armory and attain an altitude of 250 feet before sailing off over the Connecticut River. It was reported that the pilot demonstrated that he could control the height and direction of the aircraft at will. One account of the historic flight was recounted in the Marshall County Republican, on July 18, 1878. 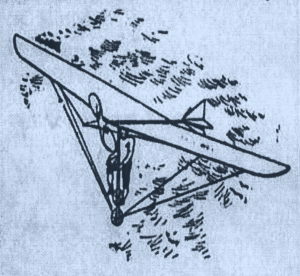 As a point of fact, Professor Ritchel’s flying machine made two flights at Hartford – the second on the following day, June 13th. The wind pushed the machine towards the town of New Haven and observers lost sight of it after it went over a hill. 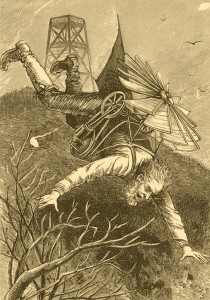 After struggling in the wind for about an hour, Quinlan landed in Newington, Connecticut, and waited until the winds died down before taking off again and returning to Hartford at 10 p.m.
From Hartford, the professor brought his machine to Boston where on July 4, 1878, he flew it for one hour and twenty minutes in a wind that was blowing 18 to 20 miles per hour. A few days later on July 13th, an illustration of Ritchel in his flying machine appeared on the cover of Harpers Weekly magazine. The gas bag was said to be made of rubber coated “zephyr cloth” capable of holding 2,200 square feet of hydrogen gas. This contradicted earlier reports that the dirigible held 3,000 square feet of gas, but this may have been a different, or improved gas bag. The machine could navigate the air by two sets of multi-blade fans, one positioned under the pilot’s seat to raise or lower the craft, and the second at the front of the aircraft to propel it forward or backwards or steer in one direction or another. The fans were reportedly made of white Holly, each blade having about 50 square inches of surface, and capable of making 2,000 to 2,800 revolutions per minute. The fans were powered by the operator manually turning hand-cranks and steering with his feet, without the aid of any mechanical engine. The total weight of the machine, not counting the operator, was said to be 115 pounds. Professor Charles F. Ritchel is buried in Mountain View Cemetery and Mausoleum, Plot 46A, in Bridgeport, Connecticut. The Democratic Advocate, (Westminster, Md. ), (No headline) May 25, 1878. If the following story is to be believed, it is perhaps the first mechanically involved aviation related accident to occur in the state of Connecticut, and possibly New England. Zephaniah Phelps, age 75, was said to be an inventor whose main interests focused on perpetual motion and aerial flight. He lived in a hut in the woods near the town of Avon, Ct., and reportedly wasn’t taken seriously by those who knew him. Undaunted, Mr. Phelps built a flying-machine of his own design, and by the early winter of 1884 he was ready to test it. While standing atop the observation tower, Phelps donned his machine and secured himself to it with a rope. After starting the small engine, he leaped into space. Phelps dropped into some trees about 700 feet below the tower breaking several bones. The newspaper account goes on to state he was found by a hiker who happened to hear his groans, which would seem to indicate that there hadn’t been any witnesses to the whole affair. Phelps was reportedly carried to a house about a mile away for treatment of his injuries. Two other aviation related accidents known to have occurred on Talcott Mountain happened in 1971 and 1972. On December 15, 1971, a Simsbury, Connecticut, pilot crashed on the mountain in heavy fog. He reportedly escaped with only a few minor scratches. On April 13, 1972, a man from Virginia was killed when his plane crashed and burned on Talcott Mountain in heavy fog. Morning Journal and Courier, (New Haven, Ct.), “A Perilous Ride – An Old man’s Unsuccessful Trial Of A New Flying Machine”, December 22, 1884. Hartford Courant, “Crash on Takeoff Leaves Pilot Hurt”, January 23, 1975. Article is primarily about a man who crashed in Simsbury, Connecticut, on January 22, 1975. In that instance a Beechcraft Musketeer crashed in a field just after takeoff, after having completed its annual inspection. The pilot was transported to a hospital for treatment. The end of the article relates that two other crashes had occurred in Simsbury, both on Talcott Mountain. On September 21, 1976, a 29-year-old hang-glider from Wethersfield, Connecticut, was killed when he crashed just after taking off from the top of Talcott Mountain. According to witnesses he fell 150 feet and came down in a tree. Source: Providence Evening Bulletin, “Conn. Hang-Gliding Expert Killed,” September 22, 1976, page A-12.